This is a rich, country-style venison sausage recipe where the dominant spices are ground bay leaves and garlic. These are especially good for grilling, as bay seems to go well with the flavors that come with cooking over an open fire. I like these as a coarse sausage, but you can grind it finer if you’d like. I also prefer a mix of venison and pork — and do your best to use pork that has never been frozen. This is important, because never-frozen meat, when ground, binds to itself better than pre-frozen meat. And you will be judged on how nice your bind is with sausages. No one likes crumbly sausage. You will want really fatty pork shoulder or pork belly, or a mix of both. For those of you who don’t know about dry milk powder, it’s used to retain moisture in smoked sausages; skip it if you don’t plan on smoking your sausages — likewise with the Instacure No. 1. This is a curing salt that protects the meat from bad bacteria while you’re smoking it. Skip it if you are just making sausages for the grill. 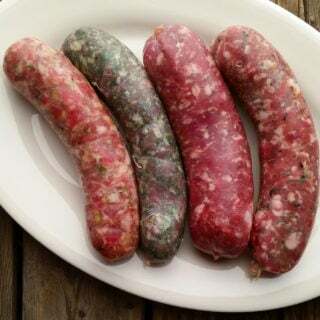 If you are unfamiliar with making fresh sausages, I wrote a basic tutorial on my friend Elise’s site here. It goes without saying that while this is a venison sausage recipe, you can make it all pork, or any mix of meats. This is a basic country style venison sausage. Use it as a master to play with. Vary anything you like, but pay attention to salt. Even a little difference in salt is noticeable. Take out some hog casings and set in a bowl of warm water. When you are ready to grind, mix the meat and fat with all the herbs and spices. If you are using the dry milk powder, mix that in, too. 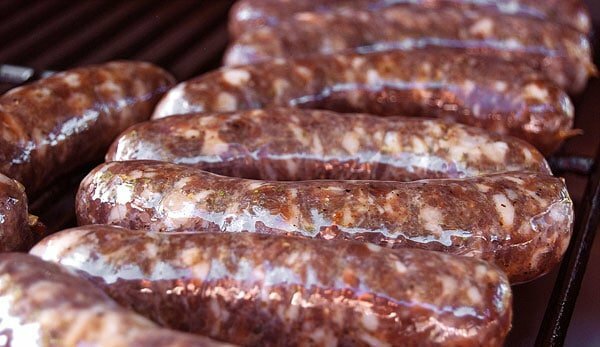 I use it when I slow-smoke sausages; it helps them retain moisture and shrink less after they come out of the smoker. Make sure the meat and fat are 37°F or colder by putting the mixture in the freezer for an hour or so. Put the wine in the fridge. Grind through your meat grinder (you can use a food processor in a pinch, but you will not get a very good texture) using the coarse die (6 mm or 7 mm). Make sure your sausage is very cold, between 28°F and 32°F. When it's cold enough, take it out of the freezer and add the wine and water. Mix the sausage thoroughly either using a Kitchenaid on low for 60 to 90 seconds or with your (very clean) hands for 2 minutes. This is important to get the sausage to bind properly. Stuff the sausage into the casings. 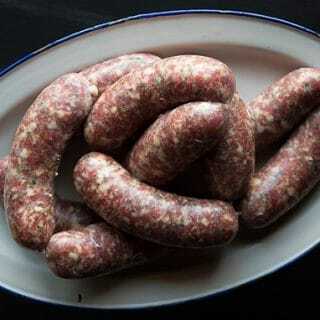 Twist off links by pinching the sausage down and twisting it, first in one direction, and then with the next link, in the other direction; this helps prevent them from unwinding. Or you could tie them off with butcher’s string. Make sure you pierce the links wherever there are air pockets; I use a needle sterilized in the flames of my stovetop. Gently squeeze the links to remove all air pockets. Hang the sausages in a cool place for up to a day (ideally hanging in a fridge, but even an hour at room temperature helps a lot). Once they have dried a bit, put in the fridge until needed. They will keep for at least a week refrigerated. If you are freezing the sausages, wait a day before doing so. This will tighten up the sausages and help them keep their shape in the deep-freeze. Pro Tip: Use carrot fiber in place of the dry milk to help retain moisture. You will only need a teaspoonful for this batch. You can buy this stuff, called C-Bind, online. Jessie: Yes you can. Use ice water instead.